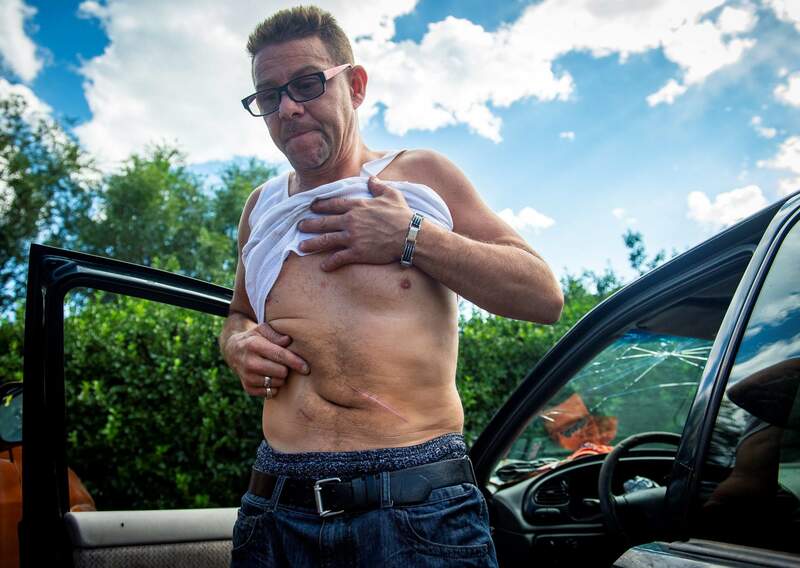 Gordon Salazar shows off a scar that runs across on his side at his home on in Colorado Springs. Salazar was stabbed in June while protecting his stepsons from Pascual Lopez, who followed them home amid a road rage incident and Lopez faces a slew of charges in the stabbing. COLORADO SPRINGS (AP) – Life hasn’t been the same, Katharine Salazar said, since her husband was stabbed three times in June by an angry man who followed their sons home after a road rage encounter. Police did pull records, though, on the number of drivers caught speeding 20 mph or more over the limit, racing or driving recklessly to give a sense of the prevalence of aggressive driving in the city. It showed that officers have written more tickets for those violations through July of this year – 1,794 – than they did in any other year back to 2014. They attributed 106 crashes to aggressive driving during the January-July time frame. Records showed offenses are most often occurring in central Colorado Springs – on or parallel to Interstate 25 – and near East Platte Avenue and Academy Boulevard. “I don’t know if it’s Colorado drivers or if people just tend to be aggressive in general when they’re driving, but I would say that I think sometimes people just get in too much of a rush,” Koch said. Within a minute of pulling out of the Sand Creek substation at Academy and Fountain boulevards, Bergstreser had pulled over his first driver. Granted, the woman’s violation was for driving without a license plate, but often drivers who hide or obstruct view of their plates – especially motorcyclists – are engaging in troublesome behavior and even “baiting” officers to chase them, he said. Then, while trying to catch one speeder driving north on Academy Boulevard, Bergstreser encountered another he estimated to be driving 10 to 15 mph over the posted speed limit and frequently swerving around other vehicles on the road – “twice without using a signal.” The vehicle also was not properly registered, and the driver was unable to provide proof of insurance. “They’re not paying attention to the fact that other people are using their blinkers and changing lanes in traffic,” he said. Since the stabbing, Kathy Salazar said they’ve noticed more road rage incidents while driving than ever before – drivers honking, speeding and swerving through traffic. She believes her “kids have learned not to engage anyone,” she said.